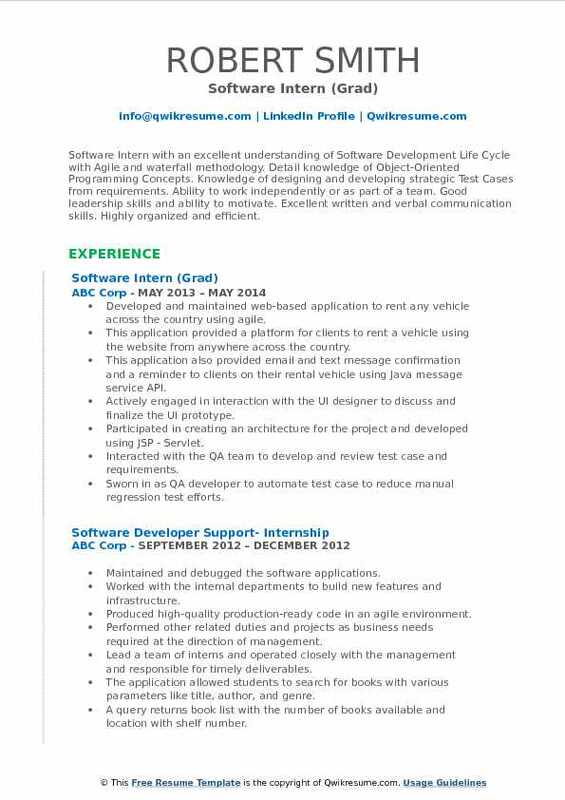 A Software Intern participates in most of the technical activities like coding, development, debugging, documentation, etc. 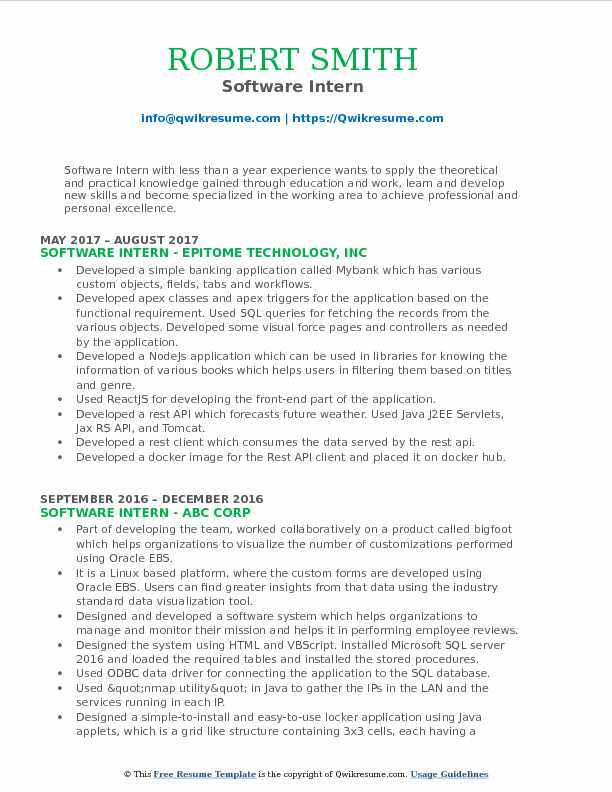 Some of the responsibilities commonly seen on the Software Intern Resume are testing and documentation of software applications, research various software offerings, assessment of new application ideas, brainstorm new ideas and strategies, develop/code applications from scratch, etc. Software Interns will generally be working with a team of professionals who will guide the interns in enhancing their skill set. 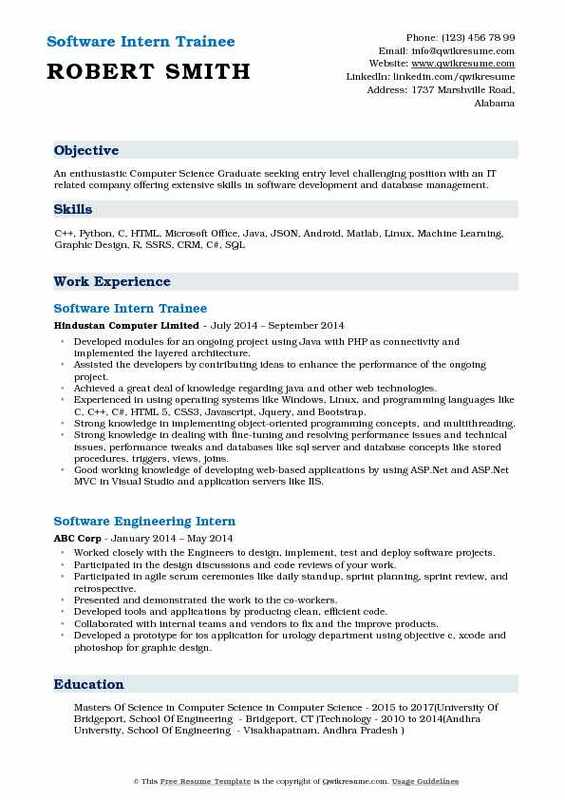 Some of the important skills that are expected from Software Interns are excellent analytical and mathematical skills, thorough knowledge in coding and testing, hands-on experience in programming, basic knowledge in database and computer architecture, up-to-date knowledge about current trends and happenings in the field of software engineering, and an urge to learn new. 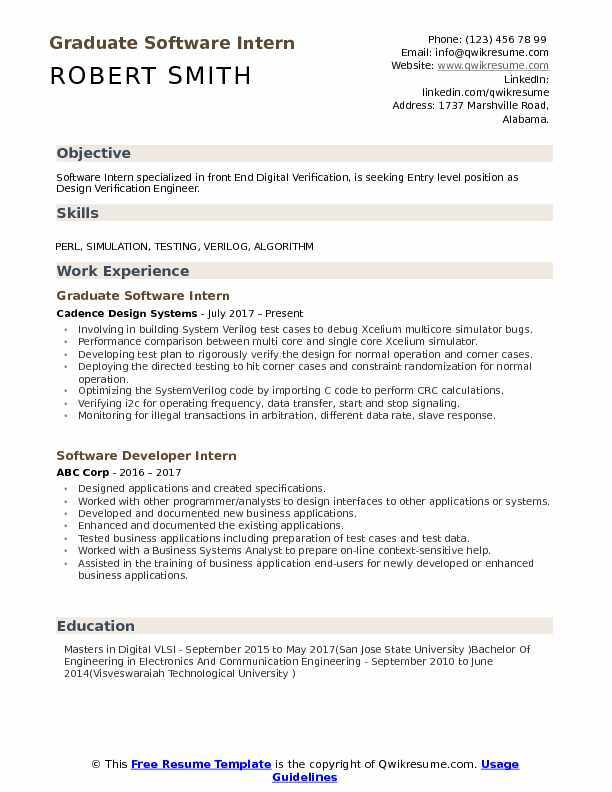 Any student pursuing Computer Science, Software Engineering, or Information Technology as their major in college can apply for this position. Objective : Software Intern specialized in front End Digital Verification, is seeking Entry level position as Design Verification Engineer. Involving in building System Verilog test cases to debug Xcelium multicore simulator bugs. Performance comparison between multi core and single core Xcelium simulator. Developing test plan to rigorously verify the design for normal operation and corner cases. Deploying the directed testing to hit corner cases and constraint randomization for normal operation. Optimizing the SystemVerilog code by importing C code to perform CRC calculations. Verifying i2c for operating frequency, data transfer, start and stop signaling. Monitoring for illegal transactions in arbitration, different data rate, slave response. Designing the DDR3 memory controller to meet the timings of Micron memory model. Implementing the initialization, calibration, precharge, activation to perform burst reads and writes. Designing the network on chip interface for CRC calculation in compliance with NXP MKw2XD family. Establishing communication between multiple CRC blocks through a network on chip interface. 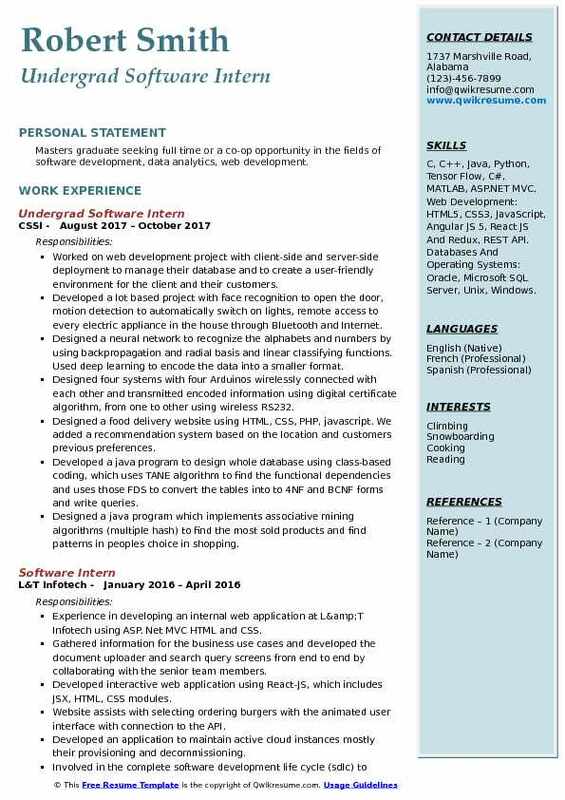 Objective : Software Intern with 2 plus years of experience is looking for Full-Time Position in the field of computer science to enhance my knowledge, technical skills and effectively utilize my abilities for contributing to the overall development of the organization and myself. Implementing tools (Perl) to validate the DB schema versions required for the application, and for building and testing the application. Expertise in running applications using Apache Maven and Apache Tomcat. Received soldier award in the company for successful completion of annual enrollment project for my clients (Allstate insurance company and Kimberly - Clark Corporation). Received enthusiastic client certificate from Allstate insurance company. Processed annual enrollment - involved in analysis, purging database, setting up new functionalities, incorporating DB2 table changes, review and monitor system, upgrade/migrate databases to current release levels, evaluated and tested new features/functionality, bug reporting. YBR site upgrade from version 5. 7 to 5. 9 - involved in analysis, purging database, review and. 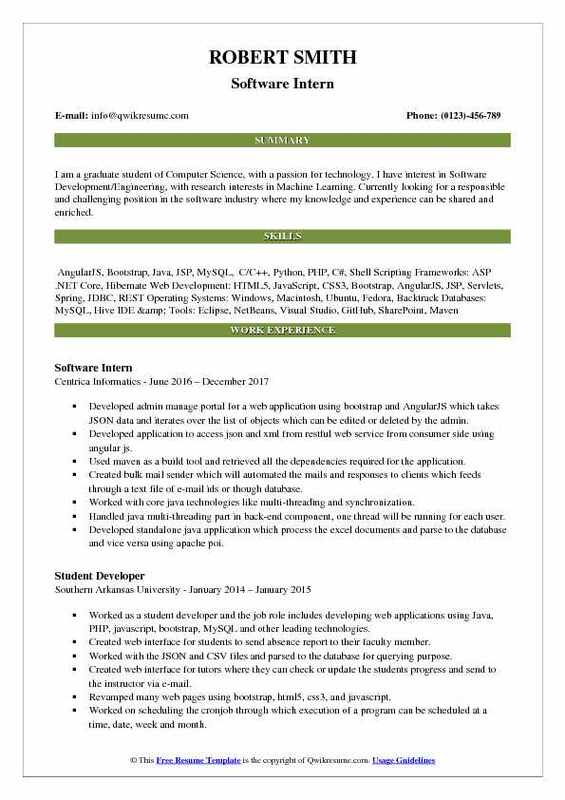 Objective : I am a graduate student of Computer Science, with a passion for technology. I have interest in Software Development/Engineering, with research interests in Machine Learning. Currently looking for a responsible and challenging position in the software industry where my knowledge and experience can be shared and enriched. Developed admin manage portal for a web application using bootstrap and AngularJS which takes JSON data and iterates over the list of objects which can be edited or deleted by the admin. Developed application to access json and xml from restful web service from consumer side using angular js. Created bulk mail sender which will automated the mails and responses to clients which feeds through a text file of e-mail ids or though database. Handled java multi-threading part in back-end component, one thread will be running for each user. Developed standalone java application which process the excel documents and parse to the database and vice versa using apache poi. Developed the application using java 8 and implemented its features like lambdas expressions, time api, streams, functional interfaces, collectors, default methods, type interfaces, foreach. Involved in development of a project using spring mvc and created jsp pages for the front end. Automated csv, json files into mysql database to make web application use that data. Resolved many issues and automated daily activities using shell scripts by creating crontabs which runs at the specified time, the day of the week, month and year. Worked on development of company website and revamped some web pages for better look and feel. Objective : Software Intern with an excellent understanding of Software Development Life Cycle with Agile and waterfall methodology. Detail knowledge of Object-Oriented Programming Concepts. Knowledge of designing and developing strategic Test Cases from requirements. Ability to work independently or as part of a team. Good leadership skills and ability to motivate. Excellent written and verbal communication skills. Highly organized and efficient. Developed and maintained web-based application to rent any vehicle across the country using agile. This application provided a platform for clients to rent a vehicle using the website from anywhere across the country. This application also provided email and text message confirmation and a reminder to clients on their rental vehicle using Java message service API. Actively engaged in interaction with the UI designer to discuss and finalize the UI prototype. Participated in creating an architecture for the project and developed using JSP - Servlet. Interacted with the QA team to develop and review test case and requirements. Sworn in as QA developer to automate test case to reduce manual regression test efforts. Developed and maintained web-based application to online assignment submission system using PHP. This application provided a platform to students take new assignment topic and submit the assignment online for grading. Another side this application also provide a platform to professor put assignment topic and grade students assignment. Developed desktop based application for library management using Java. 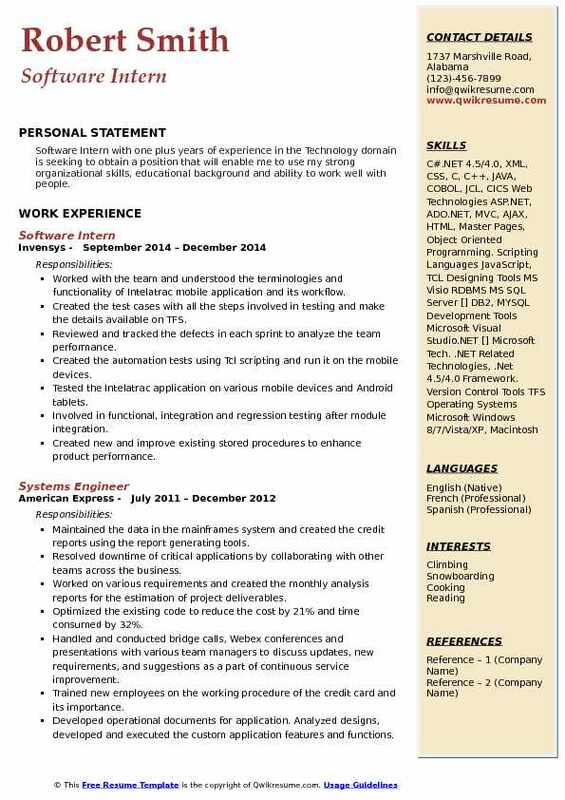 Objective : Masters graduate seeking full time or a co-op opportunity in the fields of software development, data analytics, web development. Worked on web development project with client-side and server-side deployment to manage their database and to create a user-friendly environment for the client and their customers. Developed a lot based project with face recognition to open the door, motion detection to automatically switch on lights, remote access to every electric appliance in the house through Bluetooth and Internet. Designed a neural network to recognize the alphabets and numbers by using backpropagation and radial basis and linear classifying functions. Used deep learning to encode the data into a smaller format. Designed four systems with four Arduinos wirelessly connected with each other and transmitted encoded information using digital certificate algorithm, from one to other using wireless RS232. Developed a java program to design whole database using class-based coding, which uses TANE algorithm to find the functional dependencies and uses those FDS to convert the tables into to 4NF and BCNF forms and write queries. Designed a java program which implements associative mining algorithms (multiple hash) to find the most sold products and find patterns in peoples choice in shopping. Designed a python program implementing multiple clustering algorithms like kmeans, learning vector quantization, KNN, and hierarchical agglomerative clustering and evaluated their performance on it. 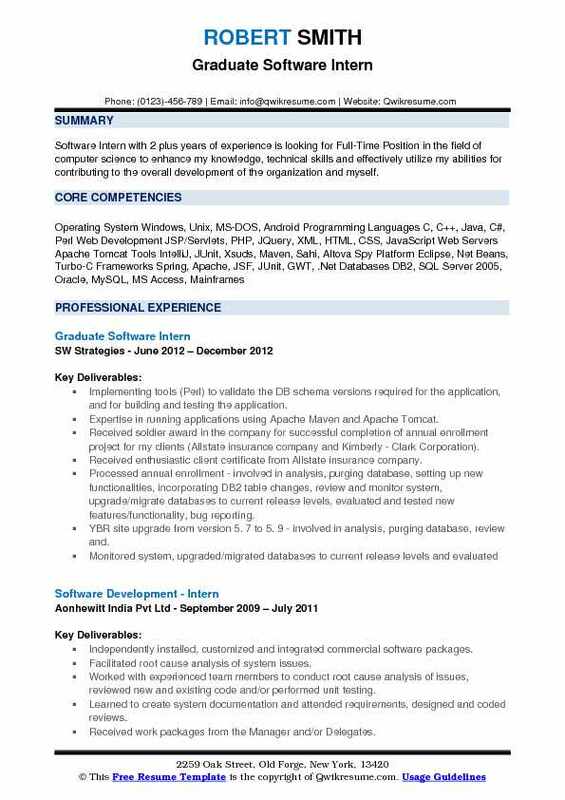 Objective : An enthusiastic Computer Science Graduate seeking entry level challenging position with an IT related company offering extensive skills in software development and database management. Developed modules for an ongoing project using Java with PHP as connectivity and implemented the layered architecture. Assisted the developers by contributing ideas to enhance the performance of the ongoing project. Achieved a great deal of knowledge regarding java and other web technologies. Strong knowledge in implementing object-oriented programming concepts, and multithreading. Strong knowledge in dealing with fine-tuning and resolving performance issues and technical issues, performance tweaks and databases like sql server and database concepts like stored procedures, triggers, views, joins. Good working knowledge of developing web-based applications by using ASP.Net and ASP.Net MVC in Visual Studio and application servers like IIS. Secured second prize for the paper presentation on "cloud computing". Objective : Software Intern with less than a year experience wants to spply the theoretical and practical knowledge gained through education and work, learn and develop new skills and become specialized in the working area to achieve professional and personal excellence. Skills : pycharm, git &; github, salesforce, restful api, eclipse, docker, ms office. Developed a simple banking application called Mybank which has various custom objects, fields, tabs and workflows. Developed apex classes and apex triggers for the application based on the functional requirement. Used SQL queries for fetching the records from the various objects. Developed some visual force pages and controllers as needed by the application. Developed a NodeJs application which can be used in libraries for knowing the information of various books which helps users in filtering them based on titles and genre. Used ReactJS for developing the front-end part of the application. Developed a rest API which forecasts future weather. Used Java J2EE Servlets, Jax RS API, and Tomcat. Developed a rest client which consumes the data served by the rest api. Developed a docker image for the Rest API client and placed it on docker hub. 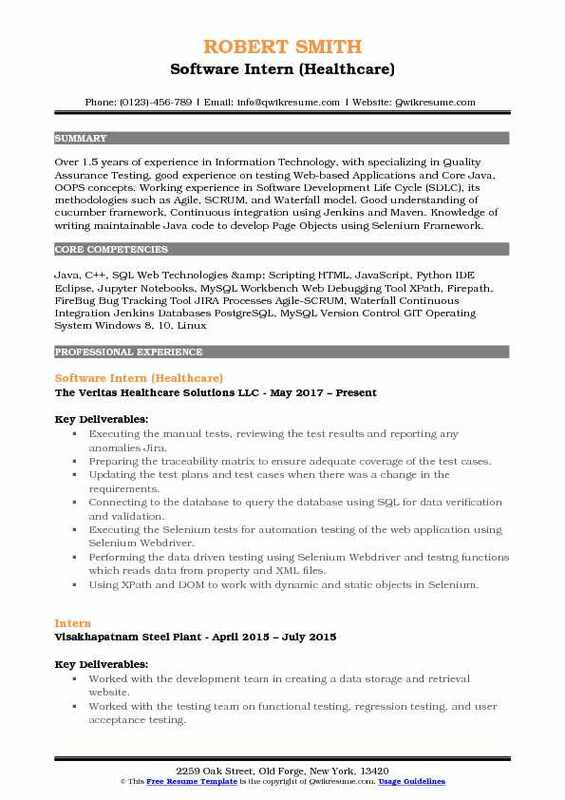 Objective : Over 1.5 years of experience in Information Technology, with specializing in Quality Assurance Testing, good experience on testing Web-based Applications and Core Java, OOPS concepts. Working experience in Software Development Life Cycle (SDLC), its methodologies such as Agile, SCRUM, and Waterfall model. Good understanding of cucumber framework, Continuous integration using Jenkins and Maven. Knowledge of writing maintainable Java code to develop Page Objects using Selenium Framework. Executing the manual tests, reviewing the test results and reporting any anomalies Jira. Preparing the traceability matrix to ensure adequate coverage of the test cases. Updating the test plans and test cases when there was a change in the requirements. Connecting to the database to query the database using SQL for data verification and validation. Executing the Selenium tests for automation testing of the web application using Selenium Webdriver. Performing the data driven testing using Selenium Webdriver and testng functions which reads data from property and XML files. Using XPath and DOM to work with dynamic and static objects in Selenium. Performing black box testing, functional testing and system integration testing. Interacting with the development team regarding defects and participating in reviewing and analyzing the bugs. Objective : Software Intern with one plus years of experience in the Technology domain is seeking to obtain a position that will enable me to use my strong organizational skills, educational background and ability to work well with people. Worked with the team and understood the terminologies and functionality of Intelatrac mobile application and its workflow. Created the test cases with all the steps involved in testing and make the details available on TFS. Reviewed and tracked the defects in each sprint to analyze the team performance. Created the automation tests using Tcl scripting and run it on the mobile devices. Tested the Intelatrac application on various mobile devices and Android tablets. Involved in functional, integration and regression testing after module integration. Created new and improve existing stored procedures to enhance product performance. Created user help document to align with the functionality changes in the product. 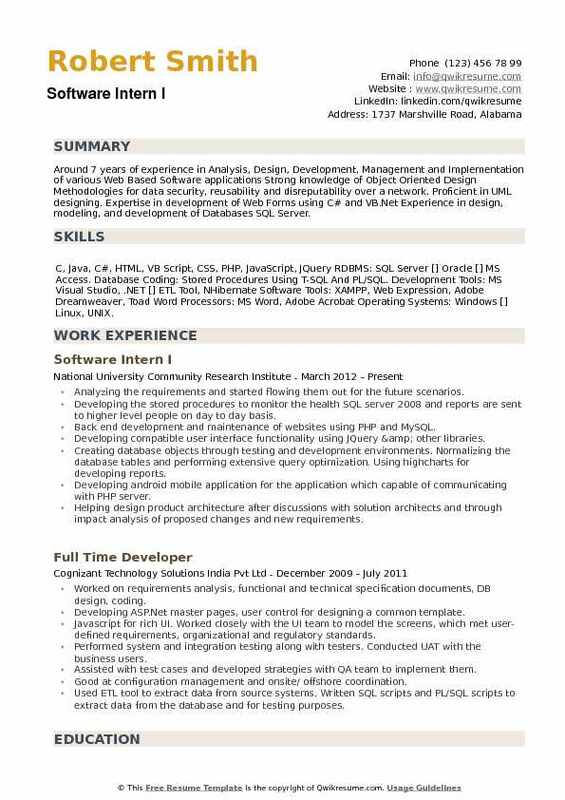 Summary : Around 7 years of experience in Analysis, Design, Development, Management and Implementation of various Web Based Software applications Strong knowledge of Object Oriented Design Methodologies for data security, reusability and disreputability over a network. Proficient in UML designing. Expertise in development of Web Forms using C# and VB.Net Experience in design, modeling, and development of Databases SQL Server. Analyzing the requirements and started flowing them out for the future scenarios. Developing the stored procedures to monitor the health SQL server 2008 and reports are sent to higher level people on day to day basis. Creating database objects through testing and development environments. Normalizing the database tables and performing extensive query optimization. Using highcharts for developing reports. Developing android mobile application for the application which capable of communicating with PHP server. Helping design product architecture after discussions with solution architects and through impact analysis of proposed changes and new requirements. Understanding the system requirement specification and set of test scenarios.